FOXBORO, Mass. – Franklin scored with the last touch of the first half and again just three minutes after the break to get its first win of the season. The Panthers defeated Foxboro 2-0 at Sam Berns Community Field in a battle of last year’s league champions. “I know Foxboro is shorthanded, missing two quality players, but they’re still a really good team, so it was a big win for us,” said Franklin coach Fran Bositis, referencing the absent duo of midfielder Joe Morrison and defender Jeff Melo, who will be out for the season after an off-field injury. 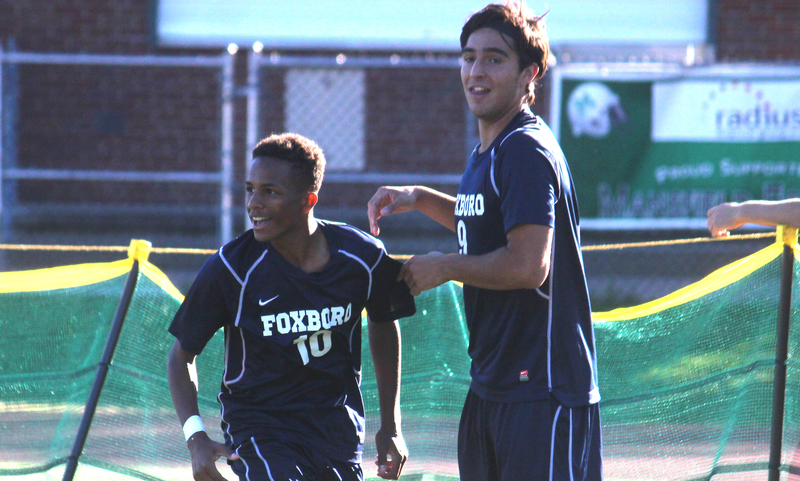 Even without Morrison patrolling the center of the pitch, Foxboro started the game on the attack, mostly through the left-side and senior attacker Devante Teixeira, who was fresh off a four-goal game against Attleboro in Foxboro’s season-opening win. Teixeira started brightly forcing Franklin keeper Henri Guilmette into a save at his near post after beating the right back with pace. The resulting corner was nearly headed in for an own goal but slipped just wide. A minute later, Teixeira drew a foul in a dangerous position, but was unable to direct Anthony Barreira’s free kick on target from close-range. 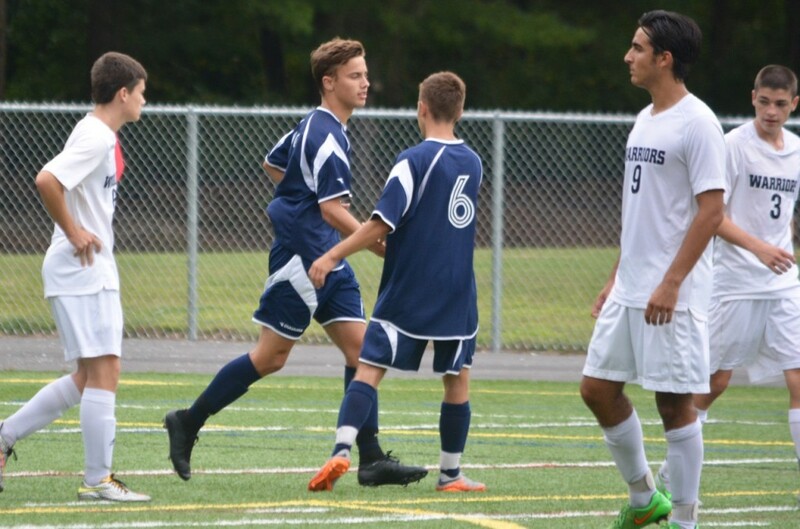 After those early chances, Teixeira faded with the combination of right backs Matt Piorier and Wesley Kozil keeping him mostly quiet with help from covering center backs Pat Kapples and Dan Geraci. While the Panthers, defense kept the Foxboro attack quiet, the Panthers midfielders started to push the Warriors back. Substitute Farley Asmath came in and created the first big chance with a cross from the left that just missed the head of Cam LeBlanc. Senior Austin Kent, the lone returning starter back from last season, almost opened the scoring with a shot from outside the box that slipped wide of the post and then his corner nearly found Nick Parent but Foxboro keeper Clay Leopold cut it out. With the clock stopped at 2:00, Kent again found space in behind the fullback, this time on the right side, and he sent in a perfect cross that was met Kevin Hall on the edge of the six-yard-box. Immediately after the ball found the back of the net, the officials signaled for halftime. Foxboro coach, and former New England Revolution player, Joe Franchino made a few adjustments at halftime to try and alter the pattern of play, including moving Barreira back into the midfield and moving Sean Millhollan up top as the striker. Unfortunately, those change had barely been put in place before Franklin had double the lead. Left back Shawn McNamara attempted to stop a cross coming in from the left but in the process the ball ricocheted off his arm, giving Franklin a chance from the spot. Kent stepped up and made no mistake, sending Leopold the wrong way and making it 2-0. “It is what it is but you’ve got to grind it out,” said Franchino about the difficulty of giving up goals on either side of halftime. Bositis admitted that the second goal eased the players’ nerves and added confidence tin a bounce back performance from the season opening loss to Oliver Ames. In the 61st minute, Piorier cleared a header off the post and started a Franklin counter that raced through LeBlanc to Hatim Brahimi and just past the toe of Hall at the far post. Three minutes later, Hall had a another chance from a LeBlanc cut back but blazed his shot over the bar. Teixeira finally got back into the game in the 69th minute but his right-footed shot after a good run was right at Guilmette, who was then forced to punch away a long free kick by Barreira. Millhollan almost cut the lead in half after good buildup play by Teixeira and Barreira, but his shot from inside the box was also saved by Guilmette. As the clock wound down, Foxboro was running out of ideas on how to get back into it and afterwards Franchino admitted that Franklin was the deserved winner. Franklin lost 16 players from last year’s Kelley-Rex Division champions and he saw a lot of growth from his relatively new roster. “I thought we won a lot of 50-50 balls today,” said Bositis. “Nick Parent kind of set the tone on that and everyone else just kind of joined in. We talked about it yesterday and once their confidence started to build, they started to play some good soccer. Franklin will look to keep momentum when it hosts Sharon on Wednesday. Foxboro may welcome Joe Morrison back for its next game at Taunton on Tuesday.